BioWare’s Anthem game was always going to court controversy. This live-service action-RPG is a departure from the single-player centric experiences that the studio has become known for delivering – Anthem was almost guaranteed to ruffle a few feathers along the way as a result. There is, however, one creative decision that seems to have ignited outrage in the hearts of BioWare fans above all else, and that surrounds the studio’s decision to make pursuing romantic relationships an impossibility in its latest release. Anthem certainly won’t be the first BioWare game to shy away from romance, but the impression that Dragon Age and Mass Effect left on players is hard to shake. Both of these series let us experience meaningful moments and passionate trysts with a cast of ever-developing characters – it's a little jarring to think that BioWare has dropped this element entirely. Rather than giving us the opportunity to build complex relationships – relationships that can ultimately culminate in romantic encounters or intimate interactions – the studio has opted instead to focus on us forming friendships with the denizens of Fort Tarsis, the fortified human settlement where Anthem’s core cast of scripted characters are contained, while simultaneously letting us build intimate relationships with our fellow Freelancers out in the open world. 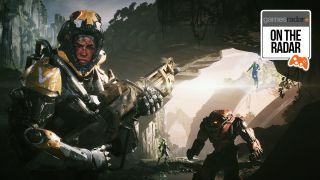 Previously, Anthem’s lead producer Mike Gamble told Game Informer flat-out that there were "no romances" in the game, but instead the focus would be on forming "friendships" and expanding on some of the themes and systems that were introduced back in Mass Effect 3’s Citadel DLC – which makes sense, given that Anthem went into pre-production shortly after BioWare shipped the 2013 expansion. Since then, however, BioWare general manager Casey Hudson has backpedalled, noting that the opportunity to form special relationships with characters could be "in the cards for the future." So, what’s the deal here? We took the question back to BioWare, speaking with Anthem and Dragon Age 4’s executive producer Mark Darrah about the birds and the bees, and why BioWare's latest universe is seemingly bereft of them – for launch at least. First, Darrah established communication and interaction is still a key theme for BioWare and will be alive and well in Anthem. "It's very much about building relationships through your interactions with them," Darrah tells us as we begin to discuss how friendships with the NPCs situated in Fort Tarsis will work. "So it's not a romance like we've had in previous games. It's more about exploring their stories, exploring their needs and their challenges – helping and guiding them through different [emotional] phases and deepening your relationship with them through these interactions." BioWare has, in the past, cited Anthem’s position as an action-RPG in an ever-evolving, always online world as one of the key reasons that the studio steered clear of letting you jump into bed with any of the NPCs this time out, but in our discussion with Darrah we get the sense that there’s more to it than that. "It's more about exploring their stories, exploring their needs and their challenges"
As you play Anthem you will write your own stories. That’s the idea, anyway. As you recall your adventures out in the real world to friends, they will be yours and yours alone to tell; BioWare is used to players recounting specific moments about specific characters that its writers once scripted, and now it wants you to be at the heart of the storytelling experience. Perhaps that’s why there’s a bigger focus on friendships between you and the NPC characters that live in Fort Tarsis – it reflects the way BioWare wants you to engage with the game world and the other players that inhabit it. Of course, that isn’t to say that the decisions you make through Anthem’s authored story won’t have an impact, that your actions won’t have consequences. In fact, there’s a strict “no take backsies” rule in place for many of the conversation choices you’ll make in Anthem, Darrah tells us with a chuckle. Fort Tarsis is designed to be an ever-evolving space for authored storytelling that can change just as constantly and reactively as the world outside of its protective walls can. At a smaller level, you may hear NPCs react to aesthetic changes in Fort Tarsis or comment on the state of the world following story missions; characters you befriend may dish out a tale to further flesh out the story, while those you upset my shut off from you entirely. On a larger level, characters inside the hub could even live or die based on your decisions if you aren’t careful. Can you lock yourself out of Fort Tarsis content? As it is in life, friendships are optional in Anthem. Engaging with the NPCs is something you can do as you choose to, although certain characters will be tied to the mysterious Factions that will exist in Fort Tarsis – the Sentinels, Arcanists, and Freelancers. It’s these three key Faction – along with, we presume, Corvus and Cyphers – where much of the major conversations and friendships will take place in Fort Tarsis. The three core Factions are there to be befriended or turned into enemies. As you make connections with these groups you will be able to acquire new missions, contracts to fulfil, and even gain access to Reputation challenges; each Faction will have three challenges at launch, and by completing these you will be able to earn points that can then be used to unlock Faction specific crafting blueprints and goodies – these relationships will also change the look of your private, instanced-off Fort Tarsis over the course of the game. While it does certainly seem that making friends with NPCs will be an interesting prospect in terms of world-building, it will have little impact on the game in terms of unlocking additional content from a gameplay perspective. There won't be any sort of gear unlocks or special abilities related to your friendships, so don’t look forward to getting cool new guns or suits because you made someone happy. The focus is solely on “exploring their [NPCs’] story, exploring their challenges and needs and helping them and guiding them in different places and deepening your relationship through that interaction,” according to Darrah. He confirmed there isn't any gameplay content "locked" behind any in-game conversations so players wouldn't feel as though they were "missing out." "One thing we found out is that people didn't know to what degree they were going to miss out on and we didn't want people to feel like when they got to Fort Tarsis they had to talk to everyone, exhaust all of those threads before they did anything else, because if you're not really engaged in that content, that is not a good experience." It means that there is a core personable story running through Fort Tarsis, the kind BioWare is famous for. It also means that you will be able to build relationships – those of the platonic variety – and have meaningful interactions and power to sway over the citizens of the hub areas, but you’re not going to be able to convince anybody to jump into bed with you – not yet, at any rate. Will Anthem have relationships as DLC? The elephant in the room with Casey Hudson previously acknowledging that the game could indeed add relationships at a later date was addressed, with Darrah shooting down the idea of paid DLC, noting that "if we did it," the content would likely arrive as free DLC. "There's nothing structurally preventing it," he said. "You look at something like Dragon Age Inquisition, where two of our most popular romances are with your agents who are never out on missions with you, they're sitting in Sky Hold. So similarly, if we were to do it, that's what it would be. People that would exist in Fort Tarsis that you'd interact with." These “new” DLC relationships could potentially work retroactively, Darrah opined, but "if we did that, we would probably want to add them in as relationships that emerge after the main story ended, so that it wasn't blocked out to other people." Anthem releases on Feb. 22 on Xbox One, PlayStation 4, and PC. Interested to learn how BioWare built a single-player story through a multiplayer game? Then you should give our interview with the studio's lead writer a read immediately.